The Concord Conservatory of Music is making a big splash this summer with a wide variety of program offerings for all ages and musical abilities. Adults and children alike will find something in our many summer camps, classes, and workshops. Designed by CCM Faculty, our workshops and boot camps provide weeklong specialized experiences in string ensembles, piano, guitar, percussion, and more. Check out our Musical Voyage program for children age groups 4 – 5.11 years and 6 – 7.11 years. The week will follow a theme which will guide the group’s exploration through musical fundamentals such as rhythmic movement, tones, and basic musical instruments through music and movement. Our Kick Start Guitar courses are great for teens and adults who want to dive into learning the guitar in a fun, social setting. 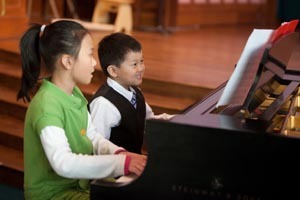 Students will learn about the fret board, technique, chords, scales, and more, all while playing favorite songs with their friends. A 12-day music training program offered to Boston public middle school and high school instrumentalists and vocalists. A youth theater program designed for middle school students (entering grades 6-9) who want to explore the world of musical theater in a fun and nurturing environment where everyone gets to perform. An immersive dance training program designed to transform technique, ignite artistry and inspire creativity. Featuring world-renowned guest artists including Zoe Scofield, Brian Brooks and Ebony Williams (B.F.A. '05). A two-week intensive for high school-aged singers who want to explore their abilities and potential as soloists, actors, choral singers and musicians. A three-week intensive that offers young dancers the opportunity to work with Broadway veterans and acclaimed faculty in a rigorous training program that includes ballet, jazz and theater dance, voice and acting. A two-week intensive for young composers who want to improve their music composition skills, build a diverse professional portfolio and learn from the Conservatory’s world-class faculty. A one-week French horn intensive for students who want to strengthen their horn technique, musicianship and performance skills in a short time. From the East: Route 2 West to Route 62. Take a left on Rt. 62 (Main St.). We are located at the corner of Pine St. and Main St. From the North or South: Take 95 to Route 2. From the West: Route 2 East to Route 62.